Jorge Montaño is a partner in the Mexico City office. His practice focuses on M&A, private equity and capital markets transactions. He has actively represented domestic and international companies in cross-border transactions, including advising on the structuring and execution of joint ventures and private equity transactions. 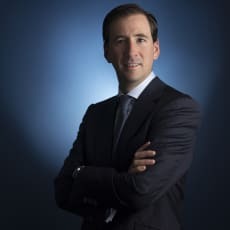 Mr Montaño also represents fund managers in the creation of their investment platforms, in Mexico and abroad, in both the private equity and venture capital sectors. In the field of capital markets, he represents US and Mexican underwriters and Mexican issuers in equity capital market transactions, including initial public offerings, and in investment-grade and high-yield bond transactions. Mr Montaño has been ranked in M&A and capital markets by many publications, including Chambers Latin America, The Legal 500 and Latin Lawyer 250. Mr Montaño collaborated in the publication of the International Financial Law Review’s Guide to Mergers & Acquisitions and the article ‘SAPIs to Promote Private Equity in Mexico’ (both in 2006). He has also co-authored the overview of the Practical Legal Guide to M&A in Mexico 2013 published by Chambers and Partners and the Mexico chapter in The Private Equity Review (2014, 2015 and 2016 editions) published by Law Business Research.